Do the Police Really Use Psychics? 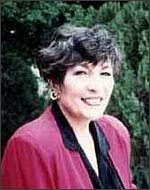 Nickell published several articles in Psychic Sleuths to the effect that while most police officers or departments take psychic information under consideration, they do not actively seek out such help—at least not under official channels. Under anonymity, several people have indicated to this author (Ramsland) that psychics have been brought into cases despite prohibitions against it. 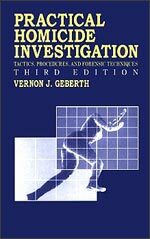 ernon J. Geberth, author of Practical Homicide Investigation, devotes five pages to how police officers can (and do) work with psychics, but Barry Fisher, in Techniques of Crime Investigation, equally as renowned to law enforcement, ignores the entire issue. 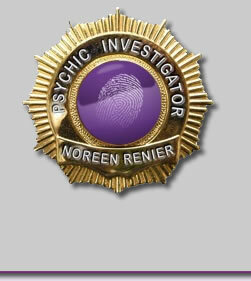 Geberth admits that it's controversial to work with psychics and that police officers are naturally skeptical of their claims, but he presents the results of his research on several psychics, including Noreen Renier (whom Gary Posner approaches with a skeptical eye in Nickell's Psychic Sleuths). He claims that if the technique has proven successful at all, it should be considered again. Calling a psychic a person who is "extra sensitive to nonphysical forces of life energy" (without explaining what that is), Geberth accepts Renier's rendition that this means "getting rid of logic and rationale." Without any basis in science, Geberth says that psychics have learned to "control a portion of the brain which is not generally used." 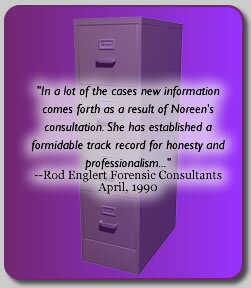 While Noreen Renier apparently prefers to hold an object that had belonged to a victim at the time of the murder, and Geberth does not raise any objections, in fact such handling could contaminate evidence and make chain-of-custody claims difficult later in court. Geberth says that an earring from a victim was sent to Reneer and she used it to determine through psychometry what the victim looked like and how she was killed. She "saw" tattoos on the murderer's arms and later said that her visions helped the police to track him down. Geberth notes that they arrested the guy based on physical evidence at the scene, but leaves the impression, without quite saying so, that the psychic solved the case. She herself, he says, advocates a way to develop and enforce strict licensing procedures for psychics, to eliminate fraud and allow the legitimate practitioners who have been properly evaluated to practice. In conclusion, Geberth notes that there is little hard research data available about how much psychics have aided in solving crimes (he offers none), and at no time does he provide a convincing case that illustrates in detail how a psychic actually did so. Yet Randles and Hough describe how psychic Rennie Wiley set up an agency in Florida in 1984 to teach police how to call on their own extra sensory abilities to solve crimes. She called her agency The Dragon's Lair and used it to form a network of psychics and retired police officers who could combine their talents and offer assistance to the local police. They specialized in finding stolen property. More interesting is Ken Charles, a British police officer who used his psychic abilities on the job. He would use his intuition, he said, to figure out how to make the offender slip up and leave clues that could be used in court. He wrote about this in his autobiography, Psychic Cop. What appears to be most annoying to police officers is that when crimes happen—especially high-profile crimes—psychics call in offering information—sometimes hundreds of them. Regardless of whether the information is even acknowledged, the psychic claims that the police consulted him or her on that case. This appears to have been the MO of more than a few famous psychics, whose cases numbered into the hundreds and thousands. How many they actually worked on, let alone were invited into, is anyone's guess. Often on any given case, no two psychics agree, so which one is to be believed? Even if one is singled out, the information that psychics give is typically too vague and impressionistic to narrow down the field of search, and it looks impressive only in retrospect. Joe Nickell asks psychics to step forward and solve the great mysteries, such as where is Jimmy Hoffa? Or who killed JonBenet Ramsey? So far, psychics have tried but none has succeeded. Says debunker Gary Posner, who criticizes the lack of controlled studies of paranormal phenomena, "There has not been a single iron-clad case, bulletproof case that has been convincing." In addition, no psychic has ever stepped forward to try for the million-dollar reward that James Randi's educational foundation offers (nor any other financial award from other agencies) for proving their psychic powers in controlled conditions. This certainly baffles the average person. Thus far, a psychic's reliability for law enforcement has not been established. Anecdotal information is sometimes impressive and even surprising, but nothing can be concluded about using psychics as resources in solving a crime.